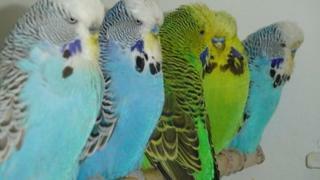 A man who had a collection of exotic birds stolen from his aviary has spoken of his distress. The 40 birds, valued at about £2,000, were taken between 23:00 GMT on 17 January and 8:20 GMT on 18 January from New Road, Tadley, Hampshire. Nigel Darley, 64, who kept the birds as a hobby, said he was "heartbroken". The birds taken include Mexican house finches, green singing finches, java sparrows, Bengalese finches, diamond doves, painted finches and waxbills. It is thought several escaped into the wild during the raid in which large holes were cut into a 32ft (9.75m) long outbuilding. Mr Darley, who has been keeping birds since he was 10, added: "I doubt they caught them all because it's such a well-planted flight [cage]. They would have been chasing them around and some of them would have got out of the holes they left. "I'm very numb. I've one hen left that has a nest inside the bird room and she's now got no mate so she's left the eggs. "That's the heartbreaking part about it - a lot of the birds are probably flying around the countryside [at the worst time] of the year." PC Jindy Sokhi, from Hampshire Constabulary, said: "It is believed that this is a targeted incident and that the offenders have knowledge of these birds. "The offenders have been careful to leave behind birds which carry identification rings and have been very selective with respect of other stolen items such as incubation equipment, catch nets and cages to transport the animals."